Update: Austin Police Department Assistant Chief Ely Reyes gave a brief statement at around 9:30 p.m. today and said an “artillery simulator” went off when a Goodwill employee tried to dispose of it. Reyes said after investigation, police determined that there was no explosive device and confirmed that the incident was not related to the other five explosions that have taken place this month. “A Goodwill employee had a found a box that someone had dropped out that contained some items that that employee didn’t think that the Goodwill wanted to have. He passed that box off to another employee who was told to dispose of the box. That employee took the box around the corner and upon looking inside of it, it had two small devices that were artillery simulators that looked like … some type of military momento,” he said at the news conference. The employee sustained injuries on his hands and arms when one of the devices went off in his hands. He was transported to the hospital and is recovering. He has since been released from the hospital. Reyes said that due to the recent package bombs, the police responded to this with federal authorities and first responders with the same precautions as any other explosive device. He added that there was no reason to believe that the incident was an attempt by a copycat. An explosion has injured a man at a Goodwill store in Austin, Texas, with police now confirming they believe the incident is not linked to the recent serial package bombings that have occurred over the past month. The Austin Police Department responded to a reported explosion in 9600 block of Brodie Ln in south Austin on Tuesday evening, March 20. The explosion occurred at a Goodwill store on Brodie Lane, the Austin Fire Department said. The building has been evacuated. Austin-Travis County EMS said one man in his 30s has been transported to the hospital with “potentially serious” injuries. They are not expected to be life-threatening. Authorities confirmed about an hour after responding to the incident that they believe the explosion was not linked to the other five package bomb blasts seen in Texas — mainly in Austin. The “items inside [the] package was not a bomb, rather an incendiary device. At this time, we have no reason to believe this incident is related to previous package bombs,” police said in a statement. The five explosions over the past 18 days have killed two people and left five injured. Hundreds of federal and local investigators are working around the clock to identify perpetrators or a motive. The first incident occurred in north Austin on March 2 where an explosive device inside a package blew up and killed a 39-old-man. The second blast from a package bomb occurred at a home in east Austin on March 12 and killed a 17-year-old man and injured a woman in her 40s, reported USA today. 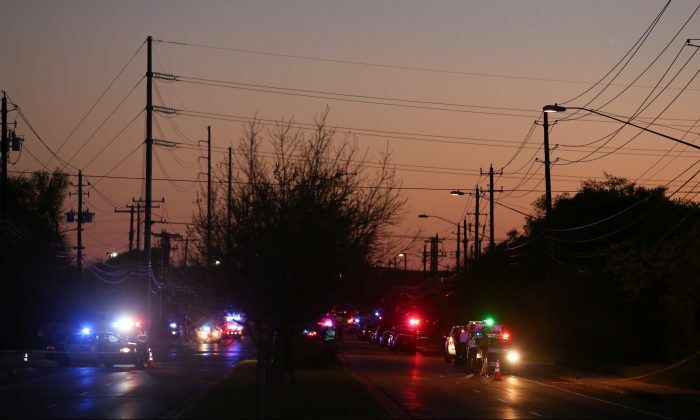 The fourth explosion occurred on March 18 on Dawn Song Drive in Austin which is believed to be activated by a tripwire. The most recent incident occurred in the early hours of Tuesday where a package bomb containing nails and metal shrapnel exploded at a FedEx distribution center in San Antonio injuring a female worker. The woman suffered minor injuries. An unexploded sixth package containing explosive material was also discovered on Tuesday at a FedEx facility in south Austin. FedEx said in a statement that they believe this package was from “the individual responsible” for the fifth explosion at San Antonio. Police have confirmed this afternoon that the two packages found in two separate FedEx facilities are linked to the earlier four explosions this month. Police have urged the suspect or suspects to surrender in a press conference on March 18. About 500 federal authorities have been sent to Austin to join the investigations. The FBI and the Bureau of Alcohol, Tobacco, Firearms and Explosives (ATF) are among those working with local officials in Austin, Schertz and San Antonio. Police are to brief the media tonight. Updates to come.